Accompanying His Grace was V. Rev. Blasko Paraklis, administrator of the Serbian mission there. Per the decision of the Holy Assembly of Bishops of the Serbian Orthodox Church, the Serbian faithful in this country are placed under the pastoral care and canonical jurisdiction of the Bishop of Western America. Serbian Ambassador to Mexico Goran Mesic prepared a warm welcome for his distinguished guests. Bishop Maxim served the Holy Hierarchal Liturgy in the Russian Orthodox monastery of Holy Trinity in Mexico City. Archimandrit Nectarios Haji-Petropoulos with the brotherhood of the monastery welcomed the Bishop and concelebrated during the Liturgy on Sunday, 7 June 2015. 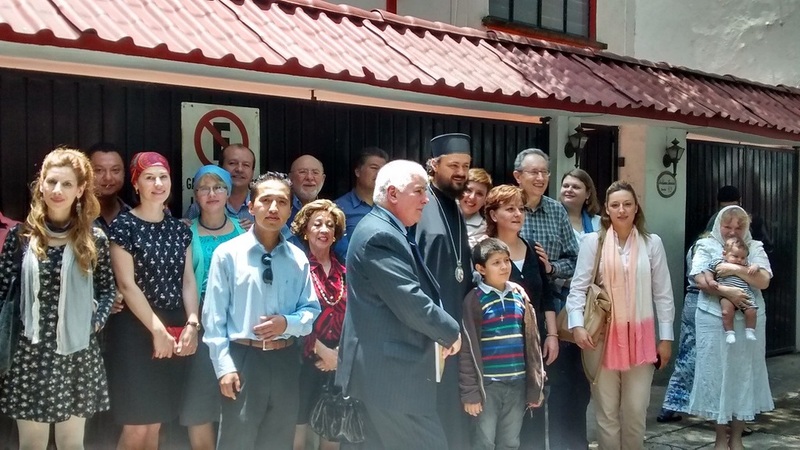 Many Russian, Serbian, Mexican and other Orthodox parishioners as well as monastery brotherhood and diplomatic corps of the Embassy of the Republic of Serbia attended the Liturgy.